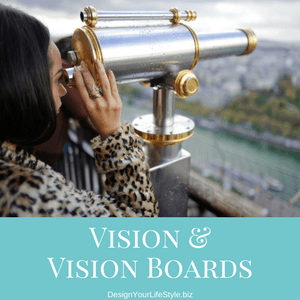 In this episode, we are discussing Vision and Vision Boards. 1. Teach you strategies & techniques so you can design your own lifestyle. 2.Share the stories of people who are designing a life they love. 3. Build a community of lifestyle designers who learn & grow from each other. In order to design your life, you must have a vision. My background is Interior Design & Architecture. We always created design boards for our clients. If designers do this for a home or a business, why would you not do a design board for your life? The most basic definition of a vision board is just this: It’s a collection of images, quotes, and symbols that have meaning to you and which bring out feelings of joy, peace, love and happiness. They represent your dream life.